Excited to be amongst a great list of design studios for our work on Pentolina. [Extract] As a nation of people who love a drink, our bars are definitely up to scratch when it comes to good design. Boasting everything from ultra cool underground haunts to world-class rooftop locales which overlook our pristine coastline, Australia’s bar scene is definitely impressive. 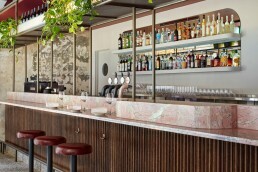 Whether it’s melding the best of laid-back Australian culture by way of sun-drenched verandas and cane chairs, or providing the ideal wintery escape in a basement in the heart of a CBD, our bars go above and beyond when it comes to their job, which, in most countries is simply to serve a drink.